This page is dedicated to those classmates no longer with us. Let us never forget them. In school, Ryan was very dedicated to playing his trumpet in a variety of bands including concert, jazz, pep, and marching. 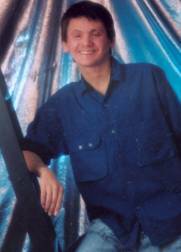 He was also involved in vocal music and attended many state contests in both areas of music. He loved Weird Al, collecting baseball cards, and hanging out with friends. He wanted to become a D.J. someday. The high school trip to France was Ryan’s highlight—he took four years of French and spoke it very well. In fact, his most famous greeting of friends was “bonjer bonjer”. Yes, he did spell it that way! :) After high school, Ryan attended NIACC and then ISU in 1994. Tim enjoyed playing football, tennis, and his trombone while in high school. Tim graduated from Wartburg College in 1996 with a bachelor’s of Arts degree in History. He was on the varsity tennis team at Wartburg and, following college, helped coach tennis in the Clear Lake Schools. Tim worked for Meints Construction and then for Dean Monson Construction in Clear Lake. Tim and his fiancée were busy making plans for an October wedding. Information courtesy obituary listed in Globe Gazette. There is an annual Tim Tjaden Memorial Golf Outing usually held in late July or early August at All-Vets. Proceeds go to funding the Tim Tjaden Memorial Scholarship awarded each year to a graduating CLHS senior. For more information, contact Scott Schroeder, Jay Barragy, Steve Spratt, or Shane Cooney. If anyone has more information to add here, feel free to contact us.